T-Mobile and HTC were focused on giving the user a very tactile experience with this phone, with 52 physical buttons including the clickable optical trackpad. The last phone I reviewed had a grand total of....three - power/lock, volume up, and volume down. Granted, that 52 figure includes the physical keyboard, but there’s still hardware buttons for most main functions. I really don’t understand optical trackpads on slates (which is why, for the most part, they no longer exist), and I didn’t get it when I had the G2 either. But after using the MT4GS, I can see how they can be useful on landscape sliders, in the sense of being able to navigate through the entire OS with just a thumb. If you are one of the seven people to ever use a UMPC, you know what I’m talking about. Having mouse-like functionality isn’t necessary with a touchscreen, but it’s nice to have when you’re hovering over the keyboard in landscape mode. Speaking of which, the backlit four-row keyboard is excellent. The single most appealing feature from the G2 is back mostly unchanged, and that’s a very good thing. Seriously, HTC does the best hardware keyboards in the business, and it’s been that way for a very long time. I’m in love. I waxed poetic about HTC hardware keyboards in my G2 preview last year, and my sentiments are exactly the same. The only real complaint you could throw the way of the keyboard is that it’s only a four row board, not five row like the Touch Pro 2 (which, in my mind at least, is the all-time benchmark in landscape smartphone keyboards). And while this is true, I understand why the decision to dump the dedicated number keys was made. Now while this means that the easiest way to enter a phone number is to go through the virtual dialer, I’ll take the more compact packaging over that fifth row basically any day. The only other minor niggle I had with the keyboard is that it takes a lot for the backlight to be triggered. In fact, until I got the Slide into a completely dark room, I didn’t realize it actually had backlit keys. While the G2 backlit keys would be triggered by most low and dim lighting situations, the MT4GS needs to actually be in complete darkness before the keyboard light goes on. The easiest way around this is to trick the phone into backlighting the keys by putting your finger over the light sensor - if the light is dim enough, the backlight will stay on even after moving your finger. It’s not a big deal, just a minor annoyance I came across. 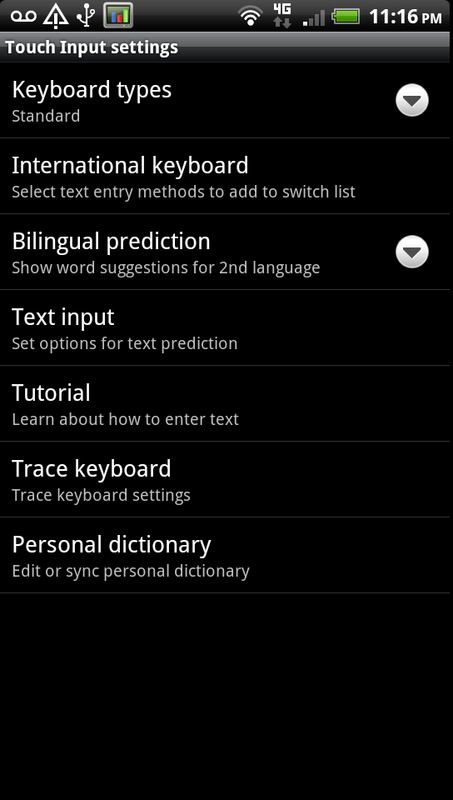 The Slide also has the Sense 3.0 keyboard and Swype preinstalled. The awesome thing here is that HTC totally lifted everything about Swype and put it into their new “Trace” feature in the Sense keyboard, except now you get to choose your own path colour. The Swype keyboard is still available as an option, but they can’t be thrilled by HTC’s move here. I’m a bit sad to say that I like the Sense keyboard better than Swype, but hey, who cares, this phone has the best hardware keyboard on the market. I refuse to use either soft keyboard out of sheer principle. It’s like getting a Ferrari and driving it with the transmission in automatic mode. Completely eliminates the point. If I wanted to use a virtual keyboard, I’d just get a Sensation.